Bloody Brilliant: CBR Soccer Team, GSS Summer Champions! 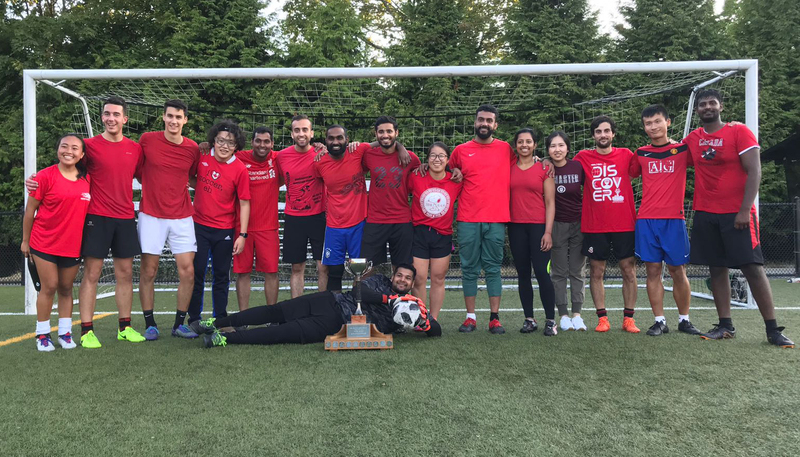 While the eyes of the world were turned to the stars competing at the World Cup 2018 in Russia, the CBR soccer team Blood Soccer took to the field in the Grad Student Society (GSS) Summer soccer league. Having improved from 4th to 3rd place in the last two seasons, the team was eager to keep the upward trend going. Right from the start, despite most players not having played in a while, Blood Soccer hit its stride with a comfortable 5-1 victory against Morphine in their opening game. Led by returning captain Prashant, there seemed to be good chemistry between the new players and the veteran core of the team. However, there was still room for improvement and the team would undoubtedly get stronger in the coming weeks as the players got more playing time together. The second game offered more suspense as Blood Soccer and Antiballies were closely matched. In the end, the difference was the combination play between new recruit Loïc and veteran Abhinav which led to an Abhinav hat trick and, in total, accounted for 3 assists and all 5 goals. This handed Blood Soccer their second straight victory as they defeated Antiballies 5-3 before heading into a break. The winning streak was cut short in the next game as Blood Soccer suffered its first defeat of the season (2-5) to Random Walkers. Blood Soccer was missing a few players and, despite the rest and practice, couldn’t match Random Walkers’ play. This loss meant Blood Soccer had to win their next game against Losers to clinch the top seed in their bracket. 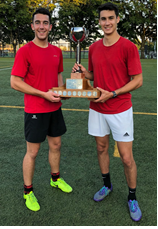 From the start, the game was tense, and the Losers were getting frustrated by the tactical play of Blood Soccer blocking the midfield and forcing long balls over the top (inevitably intercepted by Blood Soccer’s clutch defenseman Charles). In the second half, after a tackle from behind that wasn’t called by the referee, the game’s physical play was ramped up culminating in a red card for the Losers centre-back and a heated argument between the two sides. In the end, Blood Soccer’s field management gave them the 5-2 victory. Blood Soccer was in the playoffs and beat MLS FC 7-4 before facing Losers in the semi-finals. Keen to prove a point and not be intimidated by the Losers’ antics of the previous game, Blood Soccer came out all-guns-blazing with hat tricks from Loïc and Nico. Blood Soccer tucked the Losers to sleep with a crushing 9-2 victory to reach the final for the first time since the team’s inaugural season. The final matchup would be tough: Blood Soccer was facing Random Walkers. Though tied for points at the top of the standings, Random Walkers had almost double the goal differential and had handed Blood Soccer its only defeat of the season. The final started as most do, both teams closely matched and neither wanting to make mistakes. Midway through the first half Random Walkers drew first blood. Not wanting to be down at half, Blood Soccer managed to equalize shortly after and both teams entered the break locked at 1-1. The players regrouped at halftime and Prashant made some tactical changes that allowed Blood Soccer more freedom in the attacking third of the field. Right from the start of the second half the changes made an impact as a nice passing sequence ended with Loïc getting brought down inside the box. No need for VAR — it was definitely a penalty. Blood Soccer took the lead as the penalty was coolly taken. From there, the flood gates opened. A deflected shot found the back of the net before two more goals were added on by Blood Soccer for a 5-1 lead. Random Walkers did have chances, even hitting the crossbar a couple times, but were unable to answer. Even up 5-1, team captain Prashant was anxious and could be heard every 2 minutes yelling “REF, HOW MUCH TIME LEFT?!?”. At last, the final whistle came and Blood Soccer had won! For the first time, they had gone all the way and were champions. The cup was presented to Prashant and, all together, the squad celebrated as they hoisted the trophy. With this year’s success, the expectations will be high for the champions when they return to defend their title next year.